Manager Neil Lennon remains hopeful of Celtic's chances of progress in the Europa League despite defeat in their opening group match. Celtic went down 2-0 to Atlético Madrid at the Vicente Calderon Stadium. "If we play as well as we've done tonight more consistently then we'll give ourselves a good chance," Lennon told reporters. "We played we very well after a poor start. I'm hoping the players will take something from the performance." Radamel Falcao headed the Spanish side ahead from a corner early on and Diego finished well to double the lead after the break. 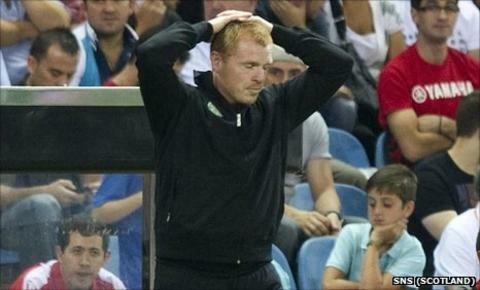 "Losing a goal from a set piece is very disappointing from our point of view," said Lennon. "But we gathered ourselves, straight away we could've equalised, Gary Hooper's in and against teams of this ilk away from home you've got to take your chances. "The second goal came probably in our best spell of the game. They've certainly got the pedigree to win it. "Atletico are an excellent side and you are going to concede possession at times but I thought there were a lot of very positive performances out there. "I'm not happy about losing the game but there's positives for us to take out of the game." Midfielder Gabi picked up a booking for a challenge on Celtic's Georgios Samaras and Lennon believes the Spaniard was fortunate not to receive more severe punishment. "I thought Gabi was very fortunate to stay on the pitch," said Lennon. "There was a tackle just on the edge of the box where it looked to me like a second yellow and even the one on Samaras when he was breaking forward was very cynical and that could be deemed as a red card never mind a yellow. "He just took him clean out and that's maybe the cynical side of the game that we maybe should do more ourselves. We were a bit honest at times, a bit too honest." Elsewhere in Group I, a late winner by Pablo Armero helped Udinese beat Stade Rennes 2-1. The Italians visit Glasgow on 29 September. Lennon's thoughts now turn to Sunday's first Old Firm match of the season against Rangers at Ibrox. "I don't think there'll be any hangover from tonight," he added. "It's a game the players are relishing and looking forward to and I'm looking for a similar kind of performance." Meanwhile, Atletico boss Gregorio Manzano denied Lennon's claim that referee Peter Rasmussen had allowed some cynical tackles from Madrid to escape the proper punishment. "No, the referee let the game flow," he said. "I don't think he favoured one team or the other. "Celtic kept things tight in the first half, but as they tired in the second half we managed to make more of the game. "At least one thing people will say is that we have started scoring after two blanks in league games. "We didn't change anything, same tactics, but it is good that we have broken that run."